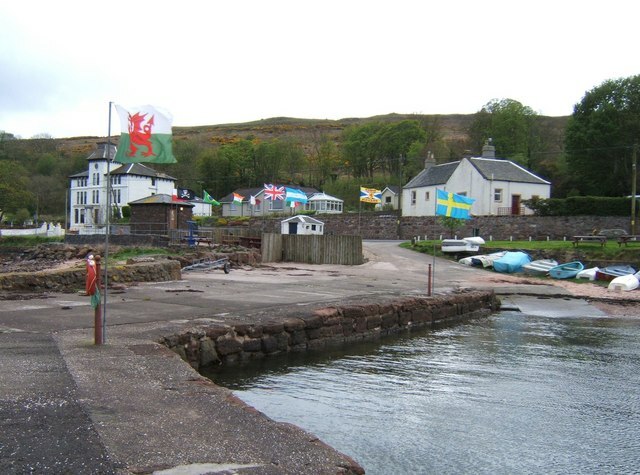 The village of Kilchattan at the south end of the Isle of Bute originally developed as a row of fisherman's houses. Further developments included a quarry, stone pier and a lime kiln which can still be seen behind St. Blane's Villa. The stone quay was constructed in 1822 and used to export lime, tiles and agricultural products and import coal and other essential materials. The quay was hampered by being only accessible by boat at high tide. The wooden Steamer Pier was opened in 1880, and was used by steamers on the Wemyss Bay to Arran run, firstly by Gillies & Campbell and then by the Caledonian Steam Packet Company. The new pier was a regular port-of-call for steamers carrying day-trippers from Glasgow. St. Blane's Hotel was constructed between the two piers and still services the tourist trade today. It remained on the Fairlie to Brodick roster of the Glen Rosa II until 1933. There was also a service from Largs and Millport. By 1955 traffic had fallen and the pier was closed. A history of the old steamer pier can be seen here..
Queen Elizabeth II and the Duke of Edinburgh landed at the new pier from the Royal Yacht Britannia in the 1960s and drove through the village. Since that heyday, the steamer traffic has disappeared and the new pier has been closed. The old stone pier, being more durable, has been renovated and now serves as the main landing point.